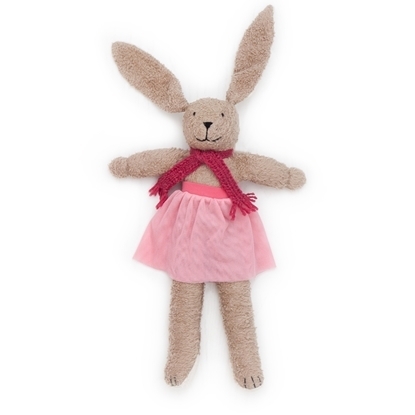 Ballerina cuddle hare, handmade of soft organic cotton and filled with pure organic wool. It wears a pink tutu and a dark pink scarf, which can be taken off to undress and dress again. So cosy to cuddle, it will become your child's best friend. 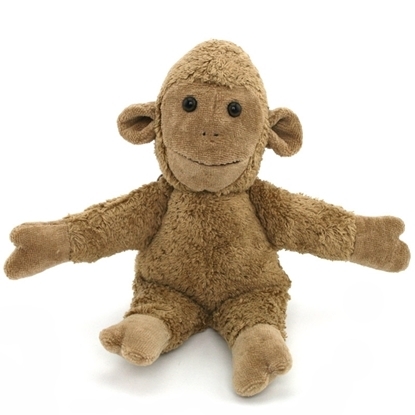 Beige cuddle monkey for children, handmade of organic cotton, filled inside with 100% virgin wool. Arms and legs are firmly sewn to the body. This cuddle is washable with care by hand or by machine (wool program). 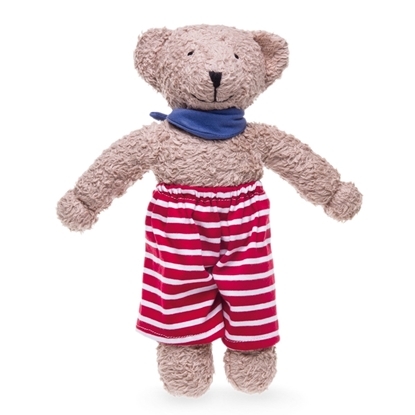 Seaside teddy bear, handmade from organic cotton and filled with 100% virgin wool from certified organic husbandry. Colors are obtained by natural coloring. 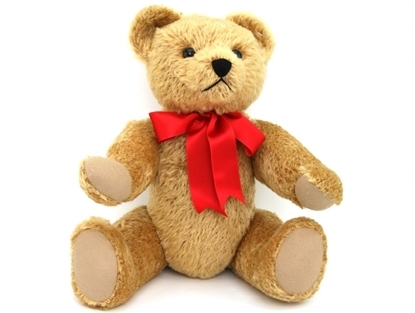 Light brown teddy bear for children, handmade of soft organic cotton and filled inside with 100% virgin wool. The snout, the hand palms and the soles of this cuddle are made of soft white mohair. Arms and legs firmly sewn to the body, allowing them to move and swing whitout danger to be ripped of. 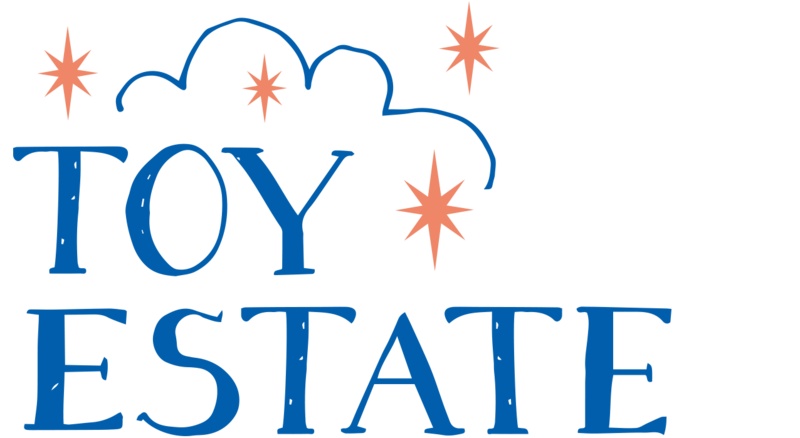 Washable with care by hand or by machine (wool program). Top priority was given to high quality materials. Little beige rabbit handmade of organic cotton and wool. The inside of the ears and the foot soles are made of white mohair. A nice little rabbit to play with. 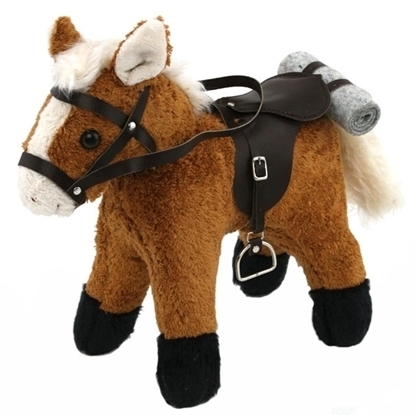 Lovely brown horse for children, stands firmly on its 4 legs, wears a saddle and bridle in genuine leather which is easily removable, handmade of organic cotton from controlled organic cultivation (kbA) and filled inside with 100% virgin wool. Great cuddle or playmate for doll horse riding. 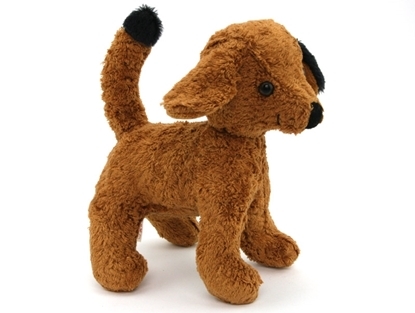 Lovely brown dog for children, stands firmly on its 4 legs, handmade of organic cotton from controlled organic cultivation (kbA) and filled inside with 100% virgin wool. 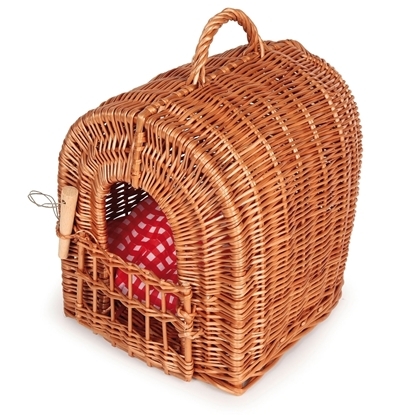 Small wicker basket with cushion in red gingham, ideal for kids to take their stuffed dog or cat on a trip or a visit. It has a small front door and an opening to comfortably carry cuddles. 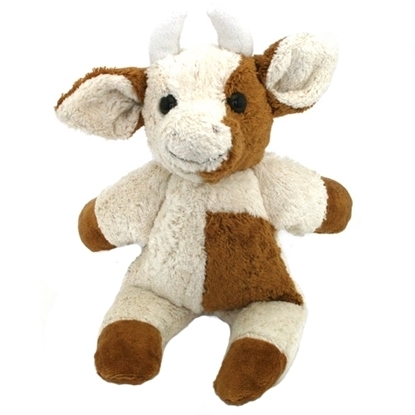 Cuddle cow for kids, handmade of organic cotton from controlled organic cultivation (kbA), filled inside with 100% virgin wool. The arms and the legs of the cow are firmly sewn to the body. 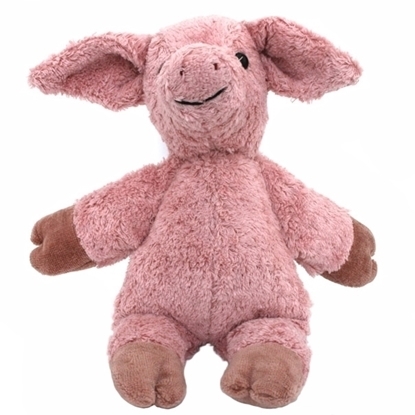 Cuddle pig for children, handmade of organic cotton from controlled organic cultivation (kbA), filled inside with 100% virgin wool. The arms and the legs of the pig are firmly sewn to the body. This cuddle is washable with care by hand or by machine (wool program). Top priority was given to high quality materials. 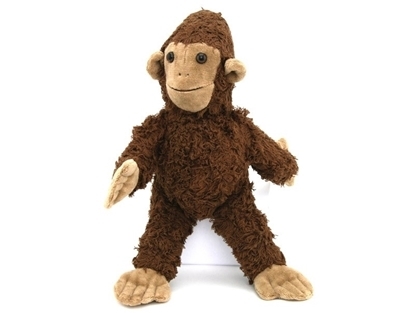 Lovely brown cuddle monkey for kids, handmade of organic cotton from controlled organic cultivation (kbA), filled inside with 100% virgin wool. The arms and the legs of the monkey are firmly sewn to the body. This cuddle is washable with care by hand or by machine (wool program). Top priority was given to high quality materials. 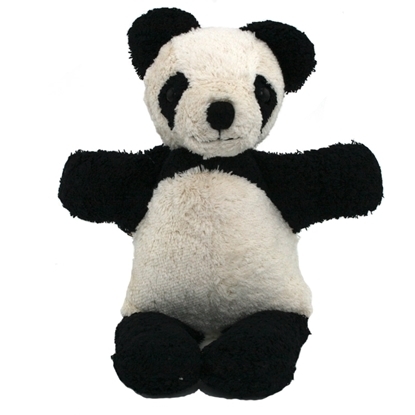 Panda bear for children, completely handmade of organic cotton from controlled organic cultivation (kbA), filled inside with 100% virgin wool. The arms and the legs of the panda are firmly sewn to the body. Top priority was given to high quality materials. White rabbit for children,handmade of organic cotton and wool. The arms and the legs of the rabbit are firmly sewn to the body. This cuddle is washable with care by hand or by machine (wool program). 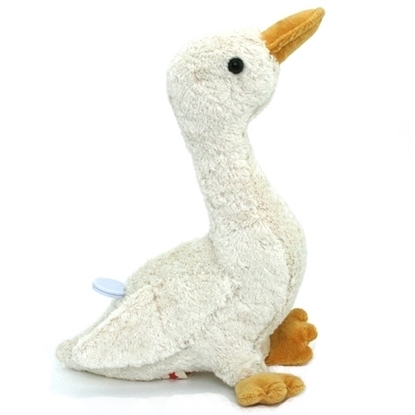 Music box goose for children, handmade of organic cotton and filled inside with 100% virgin wool, to keep company with baby or little child, while they are falling asleep. Plays the german lullaby 'Guter mond'.Beautiful birth present! 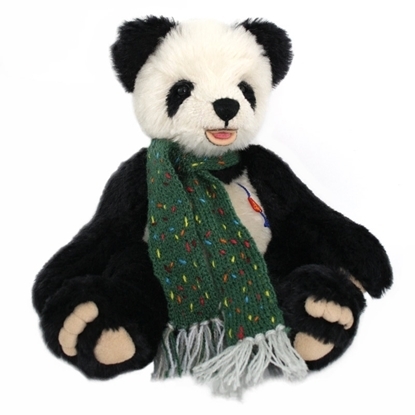 Black and white mohair Panda Bear, with green scarf, soft and cosy for children to hold in their arms and to play with. The cuddle's head, arms and legs are articulated. Limited edition of 499 pieces. 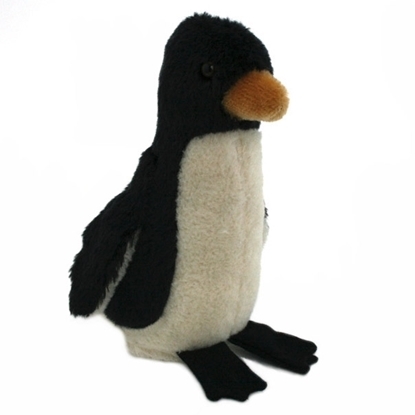 This mohair penguin for children is completely handmade of mohair, filled inside with 100% virgin wool. Top priority was given to high quality materials. Big classic mohair Teddy Bear, gold color, soft and cosy for children to hold in their arms and to play with, makes noise when turned upside down (same noise as vintage Teddy Bears make). This cuddle's head, arms and legs are articulated. 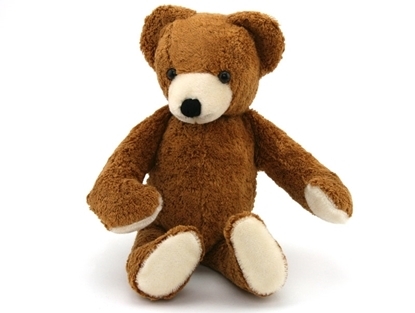 Light brown mohair Teddy Bear Aberle, soft and cosy for children to hold in their arms and to play with. The cuddle's head, arms and legs are articulated. Limited edition of 499 pieces. 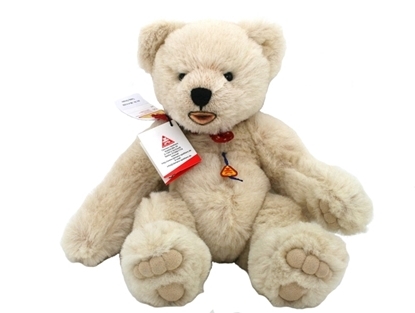 White Alpaca Teddy Bear, soft and cosy for children to hold in their arms and to play with. The cuddle's head, arms and legs are articulated. Limited edition of 499 pieces. 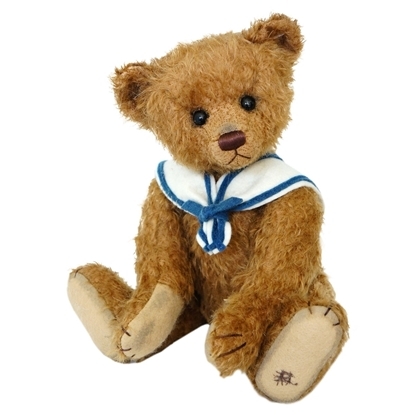 Brown mohair Teddy Bear Bruno, soft and cosy for children to hold in their arms and to play with. The cuddle's head, arms and legs are articulated. Limited edition of 299 pieces.